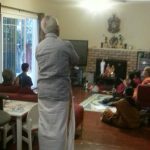 Venue: Sri Shankar’s residence, SanFransisco, CA. 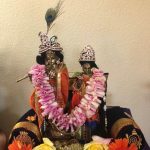 The Bay Area Satsang members celebrated Gokulashtami Utsavam with pomp and splendor. Utsavam commenced with chanting of Hare Rama Mahamantra on Janmashtami day. 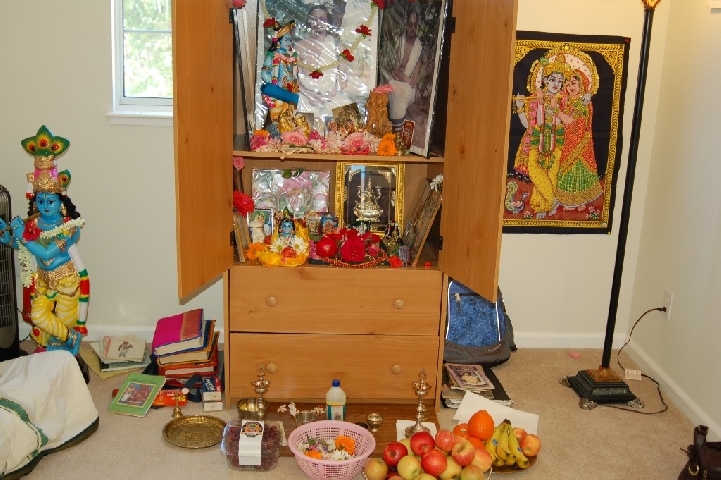 At about 10pm, Srimad Bhagavatam Patanam of Sri Krishna’s birth was performed. Arati was performed and butter was distributed to all. 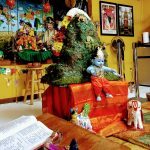 Over the next 9 days, several kirtans were sung to entertain and enjoy the lord. 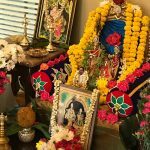 Govinda Pattabhishekam was celebrated with Srimad Bhagavatam Parayanam and chanting of the divine name ‘Govinda Govinda Govinda’. The 9th day after Janmashtami was Radha Kalyanam. The divine couple were decorated with all type of flowers. The whole satsang hall resembled a marriage hall with children running around in heights of their joy. Radha Kalyanam was performed with Ashtapadis followed by Choornikam. Satsang members blessed the divine couple with Mangala Akshada. 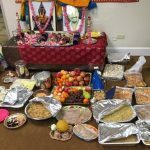 Naivedhyam and Arati was performed and followed by a grand festive lunch. The 10 day function concluded with songs composed by Sri Sri Swamiji and Hanuman utsavam. All the satsang members departed with heavy hearts. 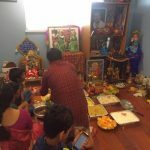 This is the 8th consecutive year of Gokulashtami utsavam celebrations in Bay Area and all satsang members thank the Lord and Sri Sri Swamiji for the abundant blessings on this occasion by providing us with the wonderful satsang for yet another year.